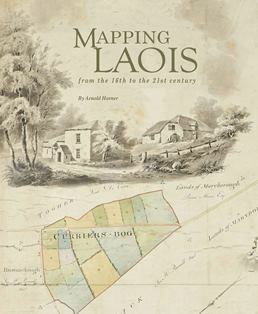 A new book – Mapping Laois: from the 16th to the 21st century – by Arnold Horner should be of interest to Irish family historians with connections to Laois, a Midlands county formerly known as Leix and Laoighis and Queen's County. If those researchers love maps, so much the better! The earliest surviving map of Laois dates from about 1560, and this is where the book starts. It reviews and provides context for the extraordinarily rich diversity of manuscript and printed maps that record the changing political, economic and social circumstances of an Irish county over nearly five centuries. The flavour of these varied, informative and often colourful maps is captured in over 400 illustrations, among which are reproductions of six early county maps and a unique assemblage of images from the Ordnance Survey ‘fair plans’ of c.1838–40. It also has a detailed index. After three years of painstaking research, the book has been published with support from Laois County Council and The Heritage Council. It is now available from the publisher, Wordwell Books, for €30. ISBN 978-1-999790.